The tomato (Solanum lycopersicum) is the berry of the tomato plant, a member of the nightshade family native to Mexico and South America. Tomatoes are scientifically classified as fruits, however nutritionists and cooks consider tomatoes to be vegetables. They are grown all over the world and come in different varieties and cultivars. In general, tomatoes are regarded as healthy foods that provide an array of benefits when consumed daily. Tomatoes come as an ingredient or a flavor element on all kinds of foods like pastas, ketchup, and pizzas. 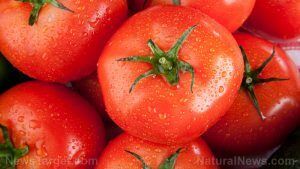 This can be advantageous in some cases since lycopene is more bioavailable in cooked tomatoes, and tomato paste has five times more lycopene than raw tomatoes. Those who wish to prepare their own tomato dishes are more than welcome to do so and are spoiled for choice since there are tomato recipes all over the Internet. A simple recipes involve roasting then seasoning tomatoes to be used for salads, sauces, or salsas. As a bonus, tomatoes 95 percent water so they relieve thirst and keep the body well hydrated; this makes them nice additions to healthy smoothies and juices. TOMATO – An Antioxidant Power Blast! The antioxidants in tomatoes assist in the maintenance of healthy skin, teeth, bones, and hair. Tomatoes can even be turned into a topical application for severe sunburns. With a high water content and decent amount of fiber, tomatoes can make bowel movements more regular and reduce constipation. The water content in tomatoes gives them a diuretic effect as well and prevents urinary tract infections. Thanks to their great quantities of potassium, eating tomatoes daily can lower hypertension.